“The collapse of the immoral ‘Jim Crow’ regime of racial segregation and discrimination in this country was, in historic terms, as swift as it was complete. It is a story worth remembering.” So begins reviewer Ray Hartwell in his recent Washington Times review of Brandt Ayers’s In Love with Defeat, newly published by NewSouth Books. Brandt Ayers is the long-time publisher of the Anniston Star and one in a long and illustrious family line of progressive journalists. 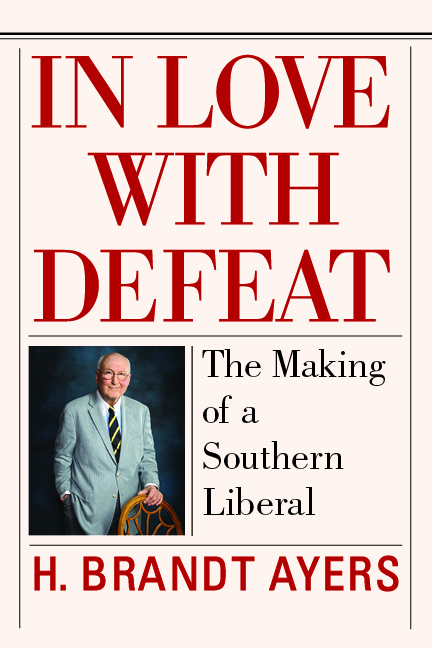 In Love with Defeat describes Ayers’s experience as a journalist and editor during the civil rights struggle, when he led the Anniston Star and worked to combat the violence and racism in his community and throughout the state of Alabama. Going beyond the civil rights movement, Ayers chronicles the journey of the state and the South from segregation to the birth of the New South movement and all the way to the election of Barack Obama in 2008. “For people who think they have read plenty about the South’s history over the past 70 years, Anniston Star Publisher H. Brandt Ayers offers a fresh take, with his personal stories chronicling not only change across the region, but the evolution of his personal politics,” writes Phillip Rawls of the Associated Press in a story that was picked up by dozens of newspapers across the country, from the Danbury (Connecticut) News Times to the San Antonio (Texas) Express-News. Read the Washington Times review of In Love with Defeat at their website, and see the Associated Press review, “Ala. publisher gets personal with Southern history,” in the Gadsden Times. In Love with Defeat is available directly from NewSouth Books, Amazon, or from your favorite bookstore. You are currently browsing the archives for the In Love with Defeat category.